Gonzalo Higuain scored after three minutes to give Juventus a narrow first-leg lead over Atalanta in their Italian Cup semi-final. Goalkeeper Gianluigi Buffon then saved a 25th-minute penalty, awarded by the video assistant referee (VAR). Juventus, seeking a fourth successive Italian Cup success, host Atalanta in the second leg on 28 February in Turin. AC Milan and Lazio meet in the other semi-final, with the first leg at the San Siro on Wednesday. 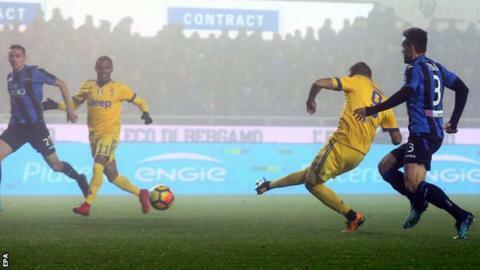 Higuain curled home the winner after slaloming through the defence for Massimiliano Allegri's side, who are second in Serie A behind Napoli. But Juve were again indebted to veteran goalkeeper Buffon, who was making his first appearance since turning 40 after a two-month layoff with a calf injury. Medhi Benatia's handball had been spotted by the VAR, but Buffon guessed right to deny Alejandro Gomez. Higuain and Blaise Matuidi had chances in the second half for Juventus, while Buffon also saved from Gomez and Andrea Petagna.